Methyl Folate™ HP contains Quatrefolic®, the most biologically active form of folate, allowing rapid uptake into the bloodstream. * This superior, methylated form of folate is metabolically active and ready for the body to use since it requires no additional conversion to be absorbed. * Folate is also necessary for the conversion of homocysteine to methionine. * The 5-MTHF in this formula is also known as the "L" form of 5-MTHF since it is the reduced form of folate. 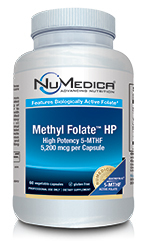 Methyl Folate™ HP contains Quatrefolic® – the most biologically active form of folate – allowing rapid uptake into the bloodstream. * This superior, methylated form of folate is metabolically active and ready for the body to use since it requires no additional conversion to be absorbed. * Folate is also necessary for the conversion of homocysteine to methionine. * The 5-MTHF in this formula is also known as the “L” form of 5-MTHF since it is the reduced form of folate. Other Ingredients: HPMC (vegetable capsule), rice flour, magnesium stearate, stearic acid, silica. Two Capsules Contain: Folate ...................................................... 10,400 mcg Provided As: 5-MTHF (6S-5-methyltetrahydrofolic acid, glucosamine salt†) . 10,400 mcg Other Ingredients: HPMC (vegetable capsule), rice flour, magnesium stearate, dicalcium phosphate, stearic acid, silica. Contains No: Wheat, corn protein, yeast, animal or dairy products, artificial colors, sweeteners or preservatives.